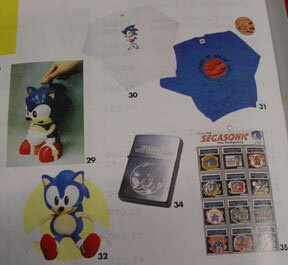 Of course, game magazines cover Sonic and his popular games. These can be collectible for just that reason. Cover stories, extensive articles, and interesting info on the latest, greatest releases. 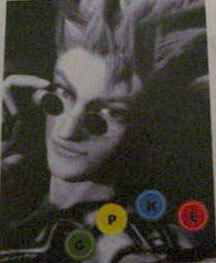 A rather hidden area of Magazine scans can be...the ever-coveted "Unreleased Screen Shots". Sometimes, magazines cover games before they're finalized and include screen shots of things that never make it into the final game. And, in the case of "Red Shoe Diaries" it covered Sonic Xtreme, the game that was never released. 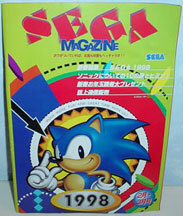 Here is Sega Magazine from 1998, released only in Japan. 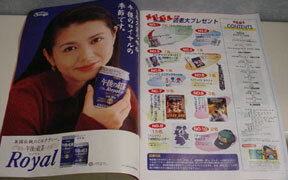 Yes, Japan is quite a bit more attentive with their promotional items, and this magazine is a nice example. It has lots of content you would like if you could read it. Here is an example page with the contents. 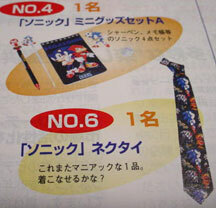 You can already see photos of Sonic items! Look at the ad for Royal canned something. Most of the ads just consist of some random person holding the item near themselves while someone writes on the bottom. Here are photos of some of the cool items available at the time. The magazine seemed to be here to inform the fans of what great stuff they could get. (What an idea! Why can't USA Sega do this?) It probably even says where to get it. Notepad, bank, shirts, patches, a tie, pencils, keychains and a mysterious disk top off the selection. This has a cool interview with Sonic Team! What kind of interesting info and opinions could be revealed? You can see photos of the game boxes, but you can't read any of it, it's all in Japanese. This is "Page Jack", a sort of fan-area for people to write in to. As you can see, there's Sonic the Hedgehog, Espio and NiGHTS fan art, along with little Sonic tidbit images and possibly info or letters. Look at this guy. This looks like a HUmar from PSO. The hair is almost exactly the same. Want to enter the Twilight Zone? He's from 1998! That's YEARS before PSO even THOUGHT about existing. Maybe it copied him. As you can see, this is a rather early/primitive attempt at 3D by WIRED magazine in the USA. 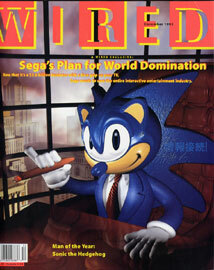 This shows Sonic as some big-wig executive type, and mis-colors his nose. Granted, it's rather ugly (and has 2 sets of fins) but it's interesting to see Sonic make the cover of a non-games magazine. What does it say in (probably) Japanese on one of his cardboard fins? This isn't exactly a magazine, but rather a book. 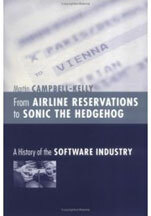 A book about The History of the Software Industry. (I'm sure its thrilling...) This is by Martin Campbell-Kelly, and is called "From Airline Reservations to Sonic the Hedgehog". Since it names him in the title...here it is! I wonder if the book itself mentions Sonic? Has anyone ever bothered to read it? I wonder if the author picked Sonic because he is a fan...or it's just something he thought up? Here, Sega Saturn Magazine announces a Sonic R story with this rendered Sonic cover. It doesn't look like standard art from the game, and comes with the headline of "It's Show Time!" Being such a popular character in the public eye, satire magazines were bound to get on-board. 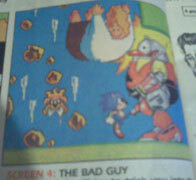 CRACKED Magazine (like a Mad Magazine) did a feature where they made fun of Sonic! There are several joke images and fake 'hints'. 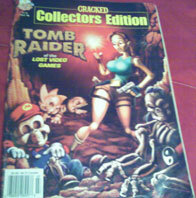 The cover has Lara Croft (Tomb Raider) in a cave discovering some 'famous fossils' of which there is a Sonic looking one, and a Mario...though neither is very accurate. 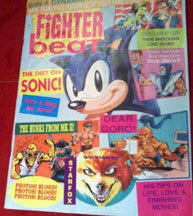 The back cover is modeled off "Tiger Beat" but changed to "Fighter Beat", complete with 1980's look title. It's full of wacky phony headlines and article teasers for a variety of video game characters. 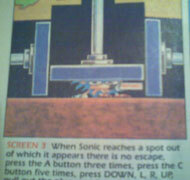 "The Dirt on Sonic! He's a hog for love!" it says bside a large accurate looking Sonic head. The "Dear Goro" section looks like a 'dear abbey' but poor Goro is multi-tasking it with his 4 arms. It also promises the scoop on Chun Li + Raiden's love affair (it's shocking) and reveales a nasty truth about Star Fox (Fox McCloud) You can also win a trip to be knocked out by your favorite fighting game character. 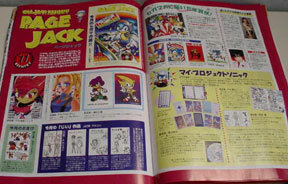 The wacky 'fake hints' section here has a picture of confused Sonic as he tries to follow their crazy directions all over the 'screen' to get to a star post. "To reach a star post put a ring monitor early in the act, go to the upper areas, jump to the right, bear to the left, jump three and a half times for absolutely no reason, press the A button and sing the national anthem backwards." 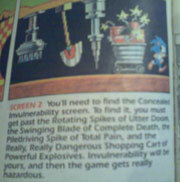 How can the fake Sonic game get really hazardous once you're invincible? Cracked would probably write a way. Here, Sonic slips past several zany hazards. "You'll need to find the hidden invulnerability screen. To find it, you must get past the rotating spikes of utter doom, the swinging blade of complete death, the pile-driving spike of total pain and the really, really dangerous shopping cart of powerful explosives. Invulnerabilitiy will be yours, but then the game gets really hazardous"
When Sonic reaches a spot out of which it appears there is no escape, press the A button 3 times, press the C button 5 times, press down, L, R, Up and pull out the controller cord and run away. This last one didn't get the description in it, but it apparently tells you how to beat Sonic 2's boss by kicking it somewhere you really shouldn't, and also dropping a fat woman on it? The rendition of the boss is especially funny. 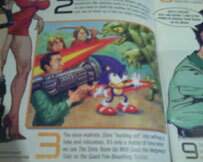 MAD Magazine also had a Sonic (mildly) feature. Though not as large as Cracked's, it's still enough to make the list. 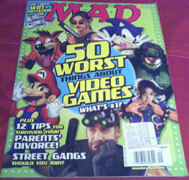 The cover shows "50 Worst things about video games" and has several famous characters. Sonic makes faces, Master Chief holds his helmet in dismay, Chun Li is worried about something, Splinter Cell guy is bored, Mario holds his nose, Crash Bandicoot looks like he ate something sour and Lara Croft appears to just be standing there. Inside the magazine, there's a type of 'countdown' article for the 50 things. "The once realistic Sims are "Busting Out" into situations that are so fake and rediculous. It's only a matter of time before we see The Sims team up with Sonic the Hedgehog to fight the giant fire-breathing turtles"
Here are 3 magazne covers from the UK. 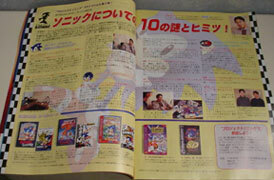 Nintendo's official magazine and Games Master, all with big Sonic related covers. The first is quite excited about Shadow's game, the second has a nice reflective effect of fire in Sonic's eyes (for Sonic WildFire, the code-name of Sonic & Secret Rings on Wii) and the last is here to highlight the new Xbox 360 Sonic game. All are great covers to collect!